Smartphone Nation Google News updated for mobile phones; shows "News near you"
Google today introduced a new feature to its Google News for mobile devices. 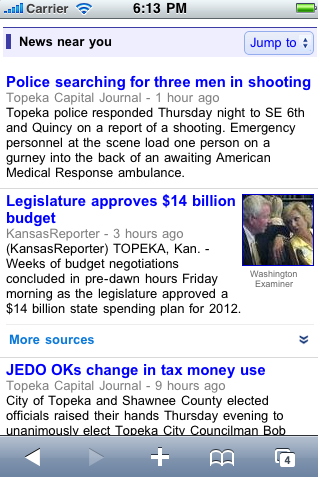 The new feature, “News near you” will show you news relevant to the city you’re in and surrounding area. To use this feature, you just have to point your Android phone or iPhone to Google News. You will then be prompted to respond to a location sharing warning. Click yes and a new section called “News near you” will be added to the bottom of your homepage. With location based services being in the news for privacy issues, Google has allowed you to turn the feature on or off anytime in the settings.